Skype for Business on an iOS, Android, or Windows Phone device provides a great online meeting experience with the latest in audio and video features, screen sharing, and ease of use. Important: To use Skype for Business, you need a Skype for Business or Lync account—typically the same user name and password you use when signing in at work or school. Browse your apps until you find the Skype for Business icon ( ), and then tap the icon to open the app. On the Start screen, swipe left to view your installed apps, search for Skype for Business, and then tap the icon to open the app. 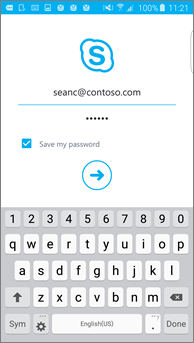 Enter your sign-in address (for example, user@domain.com) and password, and then tap Done . On the Customer Experience Improvement Program screen, tap Join to send anonymous data about app issues and usage to Microsoft, or No thanks if you prefer not to participate. On the Never Miss Your Work Calls screen, enter your mobile number with country and region codes. 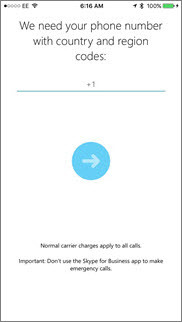 When Skype for Business can't use a Wi-Fi or cellular data network to make an audio or video call, you'll be automatically called at this number and connected to the audio portion of the call. Push notifications Get an alert when you receive a new IM or call. Normally On (recommended). Important: If you turn this setting off, you won't be notified of IMs, calls, or other Skype for Business alerts unless the app is active. 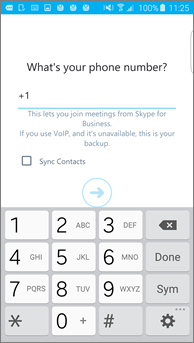 Allow phonebook access Search for contacts on your mobile phone when you search for contacts in Skype for Business. 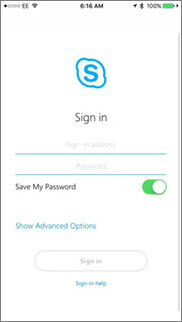 On the main Skype for Business screen, tap More > Sign out.